LTHForum.com - What are you drinking? LTH Home > Chat > Something to Drink > What are you drinking? Shake with ice, serve straight up; garnish with a sprig of tarragon, blackberries and lemon slice. Here's what I'm drinking tonight. This is pretty interesting. Complex between the currants and cherries. Very wine like. Coffee BCS is still drinking phenomenally. So smooth and delicious. Still a good amount of coffee presence. To follow up with another Half Acre release: Meat Wave. I actually like it, as a more English'd version of an IPA. It could use a little more body, but I like the apparently English hopping and its restrained character, w.r.t. over-the-top American IPAs. mtgl wrote: To follow up with another Half Acre release: Meat Wave. I actually like it, as a more English'd version of an IPA. It could use a little more body, but I like the apparently English hopping and its restrained character, w.r.t. over-the-top American IPAs. I have to agree, I found Meat Wave to be pretty successful. Instead of the usual summer gimlets lately Mrs. Trpt and I have been enjoying godmothers, sort of like black russians but with amaretto instead of kahlua. About 2 to 1 vodka to amaretto, chilled, strained into a martini glass. Katie wrote: During the heat wave the last three days, drank more than a liter of iced tea each day. Then couldn't sleep half the night. Note to self: there is indeed a reason for decaf tea. Try Arnold Palmers instead, lemonade and iced tea mixed. Decaf helps. You can add a bit of vodka if you like, works nicely. Just got back from lunch at 3 Floyds. Still had I<3Deesko on tap, which was quite nice. I wish there were more Berliner Weisses brewed. This was a bit strong for the style, but still hit all the right notes--namely, tart and funky. Not as funky as Hottenroth, but more tart and boozy. Got to try it with strawberry syrup as well. I could see enjoying it that way, but personally preferred it less sweet. Shark Pants and Eben Emael were solid, as was the Thick White Freek--this last one was just a bit too sweet from the orange concentrate, however. Glad i got to sample the four Urbain beers they had. It's warm and muggy (not by Chicago standards but definitely by Stockholm standards) and a few shandies have really hit the spot. I've been making them with homemade elderberry flower-lemonade and cheap Swedish lager. Details? we have lots of elderfowers in bloom right now. I try to make as much of this every season the elderflowers are in bloom. Start by picking 20 to 30 (or 40) elderflower clusters. Stockholm's elderflowers have gone from perfect to slightly too old over this past week but perhaps you can still find some in Chicago right now. Rinse well - ours are usually covered with aphids. Find a large, non-reactive jug or container and add the flowers. Juice and finely slice the rinds of 4-5 organic lemons and add the juice and rinds to the flowers. Warm 2 1/2 quarts water, add about 4.5 pounds of sugar and bring to a nearly a boil. I usually add a little (1 tsp) sodium benzoate to the simple syrup now after taking it off of the heat. It's not necessary but the yeasts that collect on the flowers tend to make this ferment pretty quickly otherwise. Pour the simple syrup over the lemons and flowers. Finally, for some extra tartness, add about 3.5 ounces citric acid to the mix. Let this mixture sit, cool, for 3-4 days. Mix daily. Strain and pour into clean bottles. To make the lemonade, add 4-5 parts water to 1 part syrup and enjoy! Today is margarita day. I've been using the recipe for the Topolo Margarita for a while and everyone absolutely loves them. I have nearly 2 liters of the limeaid base in carafes in the fridge so it is super easy to whip up a batch of fresh drinks whenever needed. Good idea. All the acid in the iced tea is getting to my stomach, though; I wonder if it'd be better or worse with lemonade. I really like iced coffee too, but that's even harder on my stomach. At DiCarlo's in Mundelein the other day I sampled a mixture of ginger ale, cranberry juice, and oriental apple Absolut vodka. The sample-dispensing lady said it was equal parts of each, but an equal part of cranberry juice, I later learned, turns the whole thing too candy apple red. Still, lots of combination ideas there: ginger ale with a little bit of the oriental apple vodka, ginger ale with a little cranberry juice, iced tea with a little oriental apple vodka, lemonade with cranberry juice, etc. I needed some new ideas, because DiCarlo's is the only place around that I know of to get Pimm's for a decent price and whenever the weather heats up the Pimm's sells out fast. Right now I'm drinking sparking water with lime and muddled strawberries and a little agave. Other combinations are mint or basil and lemon or lime or orange (or a combo). Works with plain water - soak sliced circles of the fruit and herbs in water in your fridge and it really infuses beautifully. Cucumber water is amazingly refreshing - with or without basil. 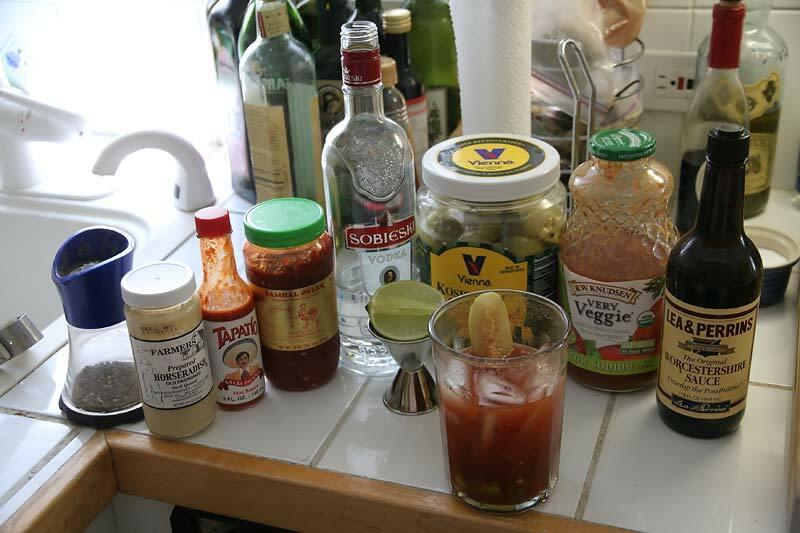 Inspired by this thread, I made some bloody marys this morning. It wasn't brunch, we weren't having company and frankly, the drink didn't really need the vodka. But if Independence Day isn't a suitable excuse for boozing before noon, what is? Technically from Saturday, but I liked the picture with its not-so-true colors. I starting to play around more and more with cocktails. I hadn't realized how much difference there is between shaking and not shaking a drink. Bruise the mint and shake the whole lot with plenty of ice. Serve on the rocks. More in the "what was I drinking" category: Glögg slushie at Simon's Tavern. We only had time for one, but I'm still thinking about it a few days later. It was fantastic. I'm pretty sure headcase will back me up on this, but another fantastic English-style IPA is from an English brewery called Meantime. Pretty common in 750 ml bottles, I've seen it on draft around the city lately (most recently at Owen & Engine). It's great - mild hop flavor, but still strong citrus notes, and probably a little maltier than domestic versions. I've also had a great Scotch ale from them and I've seen, but not yet tried, their coffee porter. I'm also thinking of Blackheart - Three Floyd's version of an English-style IPA. Of course it tops 9% but if Dreadnaught and Arctic Panzer Wolf are just too much, this one is great. It's just more... balanced than those other two. Damn shame it's seasonal, though I did see a number of bottles still at Vas Foremost. Apocalypse Cow is another oddball from them - a double IPA with lactose sugar. It's got a super thick, creamy body with a strong hop aroma. Not quite as a tropical fruit-like as Dreadnaught or agressively piney like with APZ, I look forward to it every year (and this one is probably a touch easier to find right now, being their June release - again, check Vas Foremost). Speaking of Three Floyds, but correct me if I'm wrong - Lord Admiral Nelson hasn't been released in a while, right? I'd just like to know if I missed the last time it was put out in bottles. I'm pretty sure headcase will back me up on this, but another fantastic English-style IPA is from an English brewery called Meantime. A 2001 Gran Reserva Rioja that we picked up for $10 the other day. Completely acceptable if not anything too special. IN the hot weather if I am tired of other drinks, I make a carafe of cucumber and lime water. Just Lake MI finest, put in ice and slice some cucumbers thin and also some limes (or lemons). Very refreshing. toria wrote: IN the hot weather if I am tired of other drinks, I make a carafe of cucumber and lime water. Just Lake MI finest, put in ice and slice some cucumbers thin and also some limes (or lemons). Very refreshing. I've been going through buckets of this. I usually throw some mint sprigs in with the lemon and cucumber. Leave it in the fridge and replace water as you drink it. It seems to last at least a day or two that way, maybe not as good as fresh, but still something healthy to drink. I saw this on the food channel today. Make raspberry ice cubes by placing three fresh raspberries in each of the ice cube squares and freeze. Make a ginger honey syrup by putting some honey in a pot and chopping fresh ginger in it, then put in two cups of water and bring to a simmer. Put in six tea bags, white tea if possible and steep....oh here it is I found the exact recipe. It sounded very refreshing and healthful. Thick White Freeks, just tapped (Friday afternoon) at the Map Room. It's a Witbier, but coming frm FFF, it's a wit that's been turned up to 11. Nearly 9%, it's still got a medium body and decent carbonation - it tastes pretty light still, is all. There's a super-strong orange juice flavor, though, and it definitely runs sweet. I'm enjoying it, but I'm glad it's a 12 oz. Tulip - much more and my opinion would diminish somethng fast. Still, I didn't expect FFF to send out kegs. Glad I could try some. Apparently they also had Shark Pants here, but that keg kicked earlier on Friday. While on the topic of FFF, fans of milder, Englsh-style IPA's should look fr bottles of Lord Admiral Nelson. It's a mild bitter, but being from FFF, there's a strong hop profile. Bottles just went on sale at the pub - they should hit retail in the next 1-2 weeks. Anybody get up to the Captain Fantasy release today? Cracked one already....the pear gets a bit lost in the Sorachi Ace, but it's a nice summer drink, and at 8 bucks a bomber, easy to sock a few away to see how the saison yeast develops. Shared a bottle of Sarasola Sagardoa with dinner at Aroy tonight. This basque cider came highly recommended, but it still blew my mind a little. It's an ugly drink; dull orange, cloudy, and full of floating strands of sediment that looked a little like the egg particles in egg drop soup. Oak, vinegar, and lemon rind notes on a wild, barnyardy foundation, with highlights of its sweet apple provenance to balance things out. So sour, complex, and funky that if you blindfolded me and told me that you had handed me a lambic, I might have believed it. Went great with Thai and I'm on my way out to grab a few more bottles as soon as I can. I was looking for a way to use up some stuff in the fridge, so why not a summer cocktail? The infusion was a handful of basil left in a jar of vodka for not quite 24 hours, strained. Rhubarb syrup was just rhubarb, sugar, and water. Mix in a pitcher filled with ice, serve in a highball filled with ice, garnish with a basil sprig and lemon slice. Opened a bottle of 2010 Mas des Bressades Costieres de Nimes Cuvee Tradition Rose with dinner. It was a good foil for the hot weather. The last glass was just as tasty as I stood watering the front lawn. RAB wrote: Shared a bottle of Sarasola Sagardoa with dinner at Aroy tonight. This basque cider came highly recommended, but it still blew my mind a little. It's an ugly drink; dull orange, cloudy, and full of floating strands of sediment that looked a little like the egg particles in egg drop soup. Oak, vinegar, and lemon rind notes on a wild, barnyardy foundation, with highlights of its sweet apple provenance to balance things out. So sour, complex, and funky that if you blindfolded me and told me that you had handed me a lambic, I might have believed it. Went great with Thai and I'm on my way out to grab a few more bottles as soon as I can. Interestingly, Lambic gets "sick" and results in strands of stuff floating around. I wonder if they were small bacterial colonies of souring organisms? I found a couple 750ml bottles of Founders Blushing Monk at whole foods the other day. Pours dark red, and tasted and smelled like(obviously) raspberries. I could barely taste the alcohol in it(9.2ABV), which i found somewhat surprising. It was a really smooth and refreshing drink and an awesome example of a fruit beer. Just wish I could get my hands on more of it.